Captain Robert L. Faurot (1917-1943) of Columbia, Missouri, flew Lockheed P-38 Lightning fighter-bombers with the 39th Fighter Squadron, 35th Fighter Group, Fifth Air Force. On September 21, 1942, Faurot was attempting to engage an A6M2 Zero-Sen over Lae, New Guinea, and discharged his two 500-pound bombs. The bombs exploded over the Zeke, crashing it to the ground. USAAC General George Kenney awarded him an air medal for the first Pacific kill by a P-38. Faurot was killed on March 3, 1943 during the Battle of the Bismarck Sea. 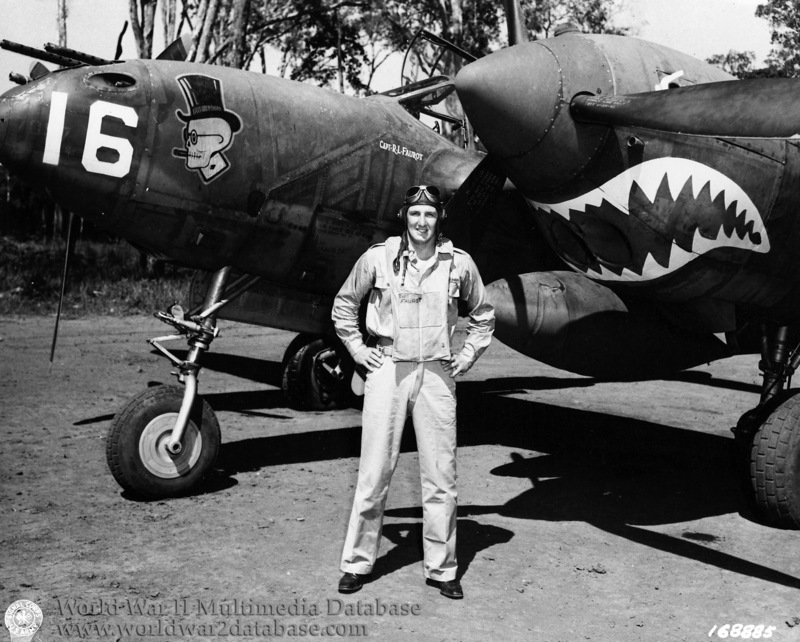 Here he is photographed after his second kill in front of his P-38F tail number 42-12633 #16 at Schwimmer Air Base ("14 mile") Laloki, New Guinea.